Following a teaser campaign involving sending a live chicken on tour, Burger King has announced that it's bringing Chicken Fries back — this time as a permanent menu item in both the U.S. and 30 international markets. The item — chicken strips shaped like fries that come with a choice of dipping sauce options — were originally launched in 2005, dropped as part of a menu revamp in 2012, and reintroduced on a limited-time basis last August. The chain, which saw a significant sales lift during the quarter in which the Chicken Fries were back as an LTO, said the permanent status reflects popular demand. A mention of the former BK item in a BuzzFeed article early last year spawned a Change.org petition to bring back Chicken Fries and spurred social media buzz, noted USA Today. “The conviction of Chicken Fries fans never ceases to amaze us," crowed Eric Hirschhorn, CMO North America, Burger King Corp.
Last week, BK and advertising agency David sent a chicken named Gloria on tour to six restaurants around the country. At each stop, the chicken determined whether the restaurant would or would not serve Chicken Fries for a day, based on whether she decided to eat from a bowl labeled "yes" or one labeled "no." The premise: The excitement generated by the events supposedly clinched BK's decision to add Chicken Fries to its menu. 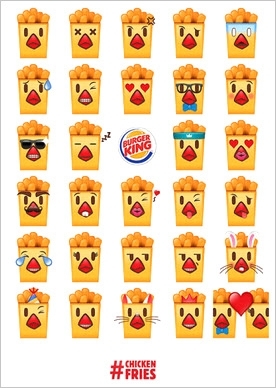 Along with the menu news, BK unleashed a barrage of digital advertising, and announced that it is offering a free Chicken Fries emoji keyboard on the iTunes App Store and Google PlayStore. BK — an official NCAA sponsor — also confirmed that it will begin running TV spots for the item during the NCAA regional semifinals starting March 26. A nine-piece order of the Chicken Fries, with sauce, is $2.89. They can also be ordered as part of a combo meal, with fries and a drink.